Wheel Spacer - 6061 Billet Aluminum - 5 on 120mm -..
Wheel Spacer - 6061 Billet Aluminum - 5 on 130mm -..
Wheel Spacer - 6061 Billet Aluminum - 5 on 100mm -..
Wheel Spacer - 6061 Billet Aluminum - 5-100/112 (1..
Wheel Spacer - 6061 Billet Aluminum - 5 on 100/112..
Coyote Accessories offers Hub Centric Billet Spacers for creating additional clearance in a wide variety of BMW, AUDI, MERCEDES and VW applications. Perfect for installing modern, positive offset wheels on older, rear-wheel drive vehicles with staggered offset! 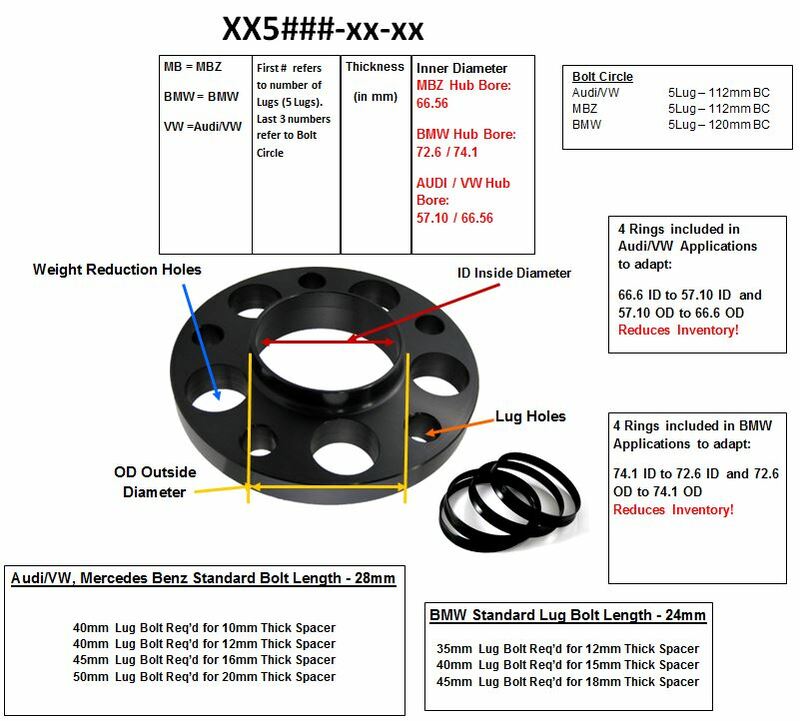 BMW spacers include 2 rings to adapt to any combination of 72.6 and 74.1mm hubs and wheel bores. Audi/VW spacers include 2 rings to adapt to any combination of 57.1mm and 66.56mm hubs and wheel bores. Coyote wheel spacers come packaged in a colorful box with installation instructions included. Coyote is committed to providing the best overall user experience and maintain the highest standards of quality and performance in the industry. Leverage this commitment by passing along more value and quality to your customers. Hub centric billet spacers are made of Air Craft Quality 6061-T6 Aluminum. 6061 aluminum is an alloy that contains magnesium and silicon as its major alloying elements. T6 refers to the heat treatment process that involves various solutions and artificial aging that increases the overall strength of the material. All Hub centric billet spacers are anodized for appearance and to resist corrosion. We're happy to custom drill any spacer not offered here. Give us a call at 877-738-9990 for pricing details.